There wasn’t really anything unusual about that morning. Everything was just as it always was. The air cooled from the night. Early rising villagers walked cattle past our hotel and out into the fields. Across the distant horizon, tourists floated in hot-air balloons. We finished our breakfast and hopped onto our motorbikes to head out into some familiar villages. Perhaps all that “normalcy” caused us to neglect prayer that morning. We were usually quite diligent with prayer, but that day we pressed on without it. Thankfully, we didn’t get far. The Lord blew up one of our motorbike tires even before we got to the end of the gravel road. As we waited beneath a shade tree for the motorbike repairman, our prayerlessness hit us simultaneously. I spoke up and said, “I’m fairly confident that the Lord blew up our tire on purpose so that we wouldn’t go any further without having spent time in prayer.” The team agreed, and we huddled up to pray. We asked the Lord to forgive us for stepping out into such an incredible task without having spent time praying for our hearts and for the hearts of the people. We asked the Lord to guide us that morning. We asked him to guide us to people who needed the gospel, who were ready to hear the gospel and who were even ready to receive the gospel. 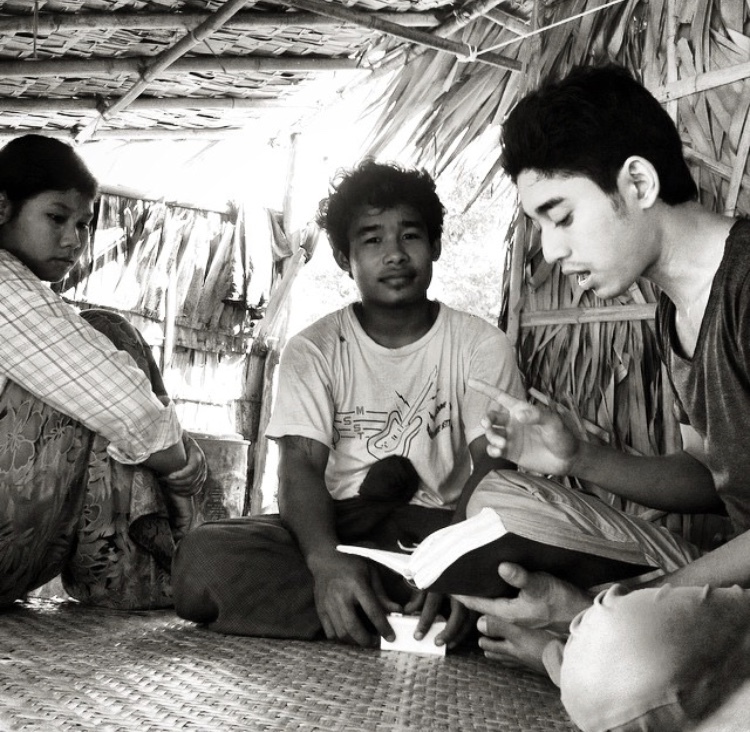 Over the years in Myanmar, we had found that praying this way, coupled with the assumption that God was indeed answering those prayers, caused us to see people and situations differently. Praying this way gave everything purpose. We were passing people on the street whom the Lord was causing us to pass. We were seeing people and going places and having conversations all under the direction of our sovereign Lord. Praying this way and believing God was answering gave us confidence and boldness that we would not have had otherwise. We prayed and said amen. Soon enough, our tire was fixed, and we were on the move again. We chose to leave the paved road and instead took dirt paths through the arid landscape. We had been down this one dirt path many times, and while slightly more dangerous than the road, it was the quickest way to get to the villages that day. We never actually made it to the villages. The Lord blew up another one of our motorbike tires. We were stopped in front of a little farm. We had passed by this little farm hundreds of times and never really thought about it—until now. Our entire team walked down to the little farm house to see if we could find any workers there. At the house we found a young man and his wife. They didn’t own the farm, but they did have a pretty nice setup. The farm’s owner hired this man and his wife to tend the land and, in addition to paying them, allowed them to stay in the little house for free. They greeted us as most Burmese would. Smiles. Palm sugar and fermented tea leaf snacks. Hot tea to drink. Apologies for the weather. And conversation. Our conversation seemed so natural. It was fluid and full. We discussed their farm, their family, their lives. We discussed my family and my life. We joked and laughed. Our conversation lacked the awkwardness that often accompanies “random” encounters like this. This was special. During our conversation, the man asked me if he could show me something. I said, “Sure!” Burmese men traditionally wear long skirts called a “paseo,” and to hold it up, they tie the top into a knot. Burmese paseo knot-tying is an incredible art and, when done correctly, the knot serves as a pocket. Well, this young man untied his knot and pulled out two full-sized lizards. He smiled and said, “Watch this.” He threw the lizards out into the sand and, before they could collect themselves and scurry off, the farmer’s dog sprang into action. The dog ran out and carefully gathered both lizards in his mouth and brought them back to the farmer. The farmer tied them back up into his paseo and assured me that he was planning to eat those lizards later that night. After a while our conversation naturally shifted to weightier topics, and I shared the gospel with him. When I was done, I asked what he thought about all I had just said. His response shocked me. “I’ve heard this story before. I have heard of this Savior before,” he said. How had he heard before? When had he heard? This didn’t make any sense. His farm was out of the way, down an unimportant dirt path in a city with no real gospel presence. I asked him to explain. We spent the following day and a half with this young farmer and his wife. We taught them more about Jesus. We taught them more about forgiveness and restoration. We taught them worship songs and how to pray. We even taught them about the public step of baptism. Before we left, the young farmer and his wife both asked us if we would baptize them because they wanted to make that public declaration of their faith in Jesus. The only problem was that they weren’t close enough to the Irrawaddy River, and although they lived on a farm, there was no real source of water that we saw. They asked the owner for permission to leave the farm but were denied. We filled it up and, before going any further, we walked back through the gospel message with the farmer and his wife. We reviewed all that we had studied together about Jesus and about the story of the Bible and about baptism. They assured us that they were ready. One at a time, they sat down in the shallow trough and were baptized. We had no intention of stopping at this farm when we started out. If things had gone our way, we would have zipped right passed this young family in route to bigger, more important places. But we finally stopped and prayed. We prayed. God answered. He guided just as we had asked. He changed hearts just as we had asked. Praise God for busted motorbike tires. Praise God for out-of-the-way farms and for awakening hearts to faith. He does infinitely more than all we ask or think. This young farmer and his wife, our brother and our sister, are evidence of that.